For other uses, see Tug of war (disambiguation). Tug of war (also known as tug o' war, tug war, rope war, rope pulling, or tugging war) is a sport that pits two teams against each other in a test of strength: teams pull on opposite ends of a rope, with the goal being to bring the rope a certain distance in one direction against the force of the opposing team's pull. The Oxford English Dictionary says that the phrase "tug of war" originally meant "the decisive contest; the real struggle or tussle; a severe contest for supremacy". Only in the 19th century was it used as a term for an athletic contest between two teams who haul at the opposite ends of a rope. The origins of tug of war are uncertain, but this sport was practised in Cambodia, ancient Egypt, Greece, India and China. According to a Tang dynasty book, The Notes of Feng, tug of war, under the name "hook pulling" (牽鉤), was used by the military commander of the State of Chu during the Spring and Autumn period (8th century BC to 5th century BC) to train warriors. During the Tang dynasty, Emperor Xuanzong of Tang promoted large-scale tug of war games, using ropes of up to 167 metres (548 ft) with shorter ropes attached, and more than 500 people on each end of the rope. Each side also had its own team of drummers to encourage the participants. In ancient Greece the sport was called helkustinda (Greek: ἑλκυστίνδα), efelkustinda (ἐφελκυστίνδα) and dielkustinda (διελκυστίνδα), which derives from dielkō (διέλκω), meaning amongst others "I pull through", all deriving from the verb helkō (ἕλκω), "I draw, I pull". Helkustinda and efelkustinda seem to have been ordinary versions of tug of war, while dielkustinda had no rope, according to Julius Pollux. It is possible that the teams held hands when pulling, which would have increased difficulty, since handgrips are more difficult to sustain than a grip of a rope. Tug of war games in ancient Greece were among the most popular games used for strength and would help build strength needed for battle in full armor. There is no specific time and place in history to define the origin of the game of Tug of War. The contest of pulling on the rope originates from ancient ceremonies and rituals. Evidence is found in countries like Egypt, India, Myanmar, New Guinea... The origin of the game in India has strong archaeological roots going back at least to the 12th century AD in the area what is today the State of Orissa on the east coast. The famous Sun Temple of Konark has a stone relief on the west wing of the structure clearly showing the game of Tug of War in progress. 1800 – tug of war begins a new tradition among seafaring men who were required to tug on lines to adjust sails while ships were under way and even in battle. There are tug of war clubs in many countries, and both men and women participate. The sport was part of the Olympic Games from 1900 until 1920, but has not been included since. The sport is part of the World Games. The Tug of War International Federation (TWIF), organises World Championships for nation teams biannually, for both indoor and outdoor contests, and a similar competition for club teams. In England the sport was formally governed by the AAA until 1984, but is now catered for by the Tug of War Association (formed in 1958), and the Tug of War Federation of Great Britain (formed in 1984). In Scotland, the Scottish Tug of War Association was formed in 1980. The sport also features in Highland Games there. Between 1976 and 1988 Tug of War was a regular event during the television series Battle of the Network Stars. Teams of celebrities representing each major network competed in different sporting events culminating into the final event, the Tug of War. Lou Ferrigno's epic tug-o'-war performance in May 1979 is considered the greatest feat in 'Battle' history. The sport is played almost in every country in the world. However, a small selection of countries have set up a national body to govern the sport. Most of these national bodies are associated then with the International governing body call TWIF which stands for The Tug of War International Federation. As of 2008 there are 53 countries associated with TWIF, among which are Scotland, Ireland, England, India, Switzerland, Belgium, Italy, South Africa and the United States. Tug of war as a religious ritual in Japan, drawn in the 18th century. It is still seen in Osaka every January. In Indonesia, Tarik Tambang is a popular sport held in many events, such as the Indonesian Independence Day celebration, school events, and scout events. The rope used is called dadung, made from fibers of lar between two jousters. Two cinder blocks are placed a distance apart and the two jousters stand upon the blocks with a rope stretched between them. The objective for each jouster is to either a) cause their opponent to fall off their block, or b) to take their opponent's end of the rope from them. Naha's annual Otsunahiki (giant tug-of-war) has its roots in a centuries-old local custom. It is the biggest among Japan's traditional tugs of war. In Japan, the tug of war (綱引き/Tsunahiki in Japanese) is a staple of school sports festivals. The tug-of-war is also a traditional way to pray for a plentiful harvest throughout Japan and is a popular ritual around the country. The Kariwano Tug-of-war in Daisen, Akita, is said to be more than 500 years old, and is also a national folklore cultural asset. The Underwater Tug-of-War Festival in Mihama, Fukui is 380 years old, and takes place every January. The Sendai Great Tug of War in Satsumasendai, Kagoshima is known as Kenka-zuna or "brawl tug". Around 3,000 men pull a huge rope which is 365 metres (1,198 ft) long. The event is said to have been started by feudal warlord Yoshihiro Shimadzu, with the aim of boosting the morale of his soldiers before the decisive Battle of Sekigahara in 1600. Nanba Hachiman Jinja's tug-of-war, which started in the Edo period, is Osaka's folklore cultural asset. The Naha Tug-of-war in Okinawa is also famous. Juldarigi (Hangul: 줄다리기, also chuldarigi) is a traditional Korean sport similar to tug of war. It has a ritual and divinatory significance to many agricultural communities in the country and is performed at festivals and community gatherings. The sport uses two huge rice-straw ropes, connected by a central peg, which is pulled by teams representing the East and West sides of the village (the competition is often rigged in favor of the Western team). A number of religious and traditional rituals are performed before and after the actual competition. Several areas of Korea have their own distinct variations of juldarigi, and similar tug-of-war games with connections to agriculture are found in rural communities across Southeast Asia. The Peruvian children's series Nubeluz featured its own version of tug-of-war (called La Fuerza Glufica), where each team battled 3-on-3 on platforms suspended over a pool of water. The object was simply to pull the other team into the pool. In Poland, a version of tug of war is played using a dragon boat, where teams of 6 or 8 attempt to row towards each other. In the Basque Country, this sport is considered a popular rural sport, with many associations and clubs. In Basque, it is called Sokatira. In the USA - A form of Tug of War using 8 handles is used in competition at camps, schools, churches, and other events. The rope is called an OCT-O PULL and provides two way, four way and 8 way competition for 8 to 16 participants at one time. Each Fourth of July, two California towns separated by an ocean channel Stinson Beach, California and Bolinas, California gather to compete in an annual tug-of-war. The towns of Leclaire, Iowa, and Port Byron, Illinois, compete in a tug of war across the Mississippi River every year in August since 1987 during Tug Fest. A special edition of the Superstars television series, called "The Superteams", features a tug-of-war, usually as the final event. The Battle of the Network Stars featured a tug-of-war as one of its many events. A game of tug-of-war, on tilted platforms, was used on the US, UK and Australian versions of the Gladiators television series, although the game was played with two sole opposing participants. Puddle Pull is a biannual tug of war contest held at Miami University. The current event is a timed, seated variation of tug of war in which Fraternities & Sororities compete. In addition to the seated participants, each team has a caller who coordinates the movements of the team. Although the university did host an unrelated freshman vs. sophomores tug of war event in the 1910s and 1920s, the first record of modern Puddle Pull is its appearance as a tug of war event in the school's newspaper, The Miami Student, in May 1949. This fraternity event was created by Frank Dodd of the Miami Chapter of Delta Upsilon. Originally, the event was held as a standing tug of war over the Tallawanda stream near the Oxford waterworks bridge in which the losers were pulled into the water. This first event was later seen as a driving force for creating interfraternity competitive activities (Greek Week) at Miami University. As a part of moving to a seated event, a new rule was created in 1966 to prohibit locks and created the event that is seen today with the exception of a large pit that was still being dug in between the two teams. The event is held in a level grass field and uses a 2-inch diameter rope that is at least 50 feet long is used for the event. Footholes or "pits" are dug for each participant at 20-inch intervals. The pits are dug with a flat front and an angled back. Women began to compete sporadically starting in the 1960s and would become regular participants as sorority teams in the mid-1980s. 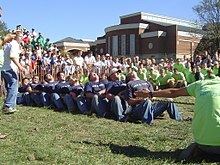 The Hope College Pull is an annual tug-of-war contest held across the Black River in Holland, Michigan on the fourth Saturday after Labor Day. Competitors are 40 members of the freshman and sophomore classes. Two teams of eight, whose total mass must not exceed a maximum weight as determined for the class, align themselves at the end of a rope approximately 11 centimetres (4.3 in) in circumference. The rope is marked with a "centre line" and two markings 4 metres (13 ft) to either side of the centre line. The teams start with the rope's centre line directly above a line marked on the ground, and once the contest (the "pull") has commenced, attempt to pull the other team such that the marking on the rope closest to their opponent crosses the centre line, or the opponents commit a foul. Lowering one's elbow below the knee during a pull, known as "locking", is a foul, as is touching the ground for extended periods of time. The rope must go under the arms; actions such as pulling the rope over the shoulders may be considered a foul. These rules apply in highly organized competitions such as the World Championships. However, in small or informal entertainment competitions, the rules are often arbitrarily interpreted and followed. A contest may feature a moat in a neutral zone, usually of mud or softened ground, which eliminates players who cross the zone or fall into it. Aside from the raw muscle power needed for tug of war, it is also a technical sport. The cooperation or "rhythm" of team members play an equally important role in victory, if not more, than their physical strength. To achieve this, a person called a "driver" is used to harmonize the team's joint traction power. He moves up and down next to his team pulling on the rope, giving orders to them when to pull and when to rest (called "hanging"). If he spots the opponents trying to pull his team away, he gives a "hang" command, each member will dig into the grass with his/her boots and movement of the rope is limited. When the opponents are played out, he shouts "pull" and rhythmically waves his hat or handkerchief for his team to pull together. Slowly but surely, the other team is forced into surrender by a runaway pull. Another factor that affects the game that is little known are the players' weights. The heavier someone is, the more static friction their feet have to the ground, and if there isn't enough friction and they weigh too little, even if he/she is pulling extremely hard, the force won't go into the rope. Their feet will simply slide along the ground if their opponent(s) have better static friction with the ground. In general, as long as one team has enough static friction and can pull hard enough to overcome the static friction of their opponent(s), that team can easily win the match. In addition to injuries from falling and from back strains (some of which may be serious), catastrophic injuries may occur and permanent damage to the body, such as finger, hand, or even arm amputations. Amputations or avulsions may result from two causes: looping or wrapping the rope around a hand or wrist, and impact from elastic recoil if the rope breaks. Amateur organizers of tugs of war may underestimate the forces generated, or overestimate the breaking strength of common ropes, and may thus be unaware of the possible consequences if a rope snaps under extreme tension. The broken ends of a rope made with a somewhat elastic polymer such as common nylon can reach high speeds, and can easily sever fingers. For this reason, specially engineered tug of war ropes exist that can safely withstand the forces generated. ^ The bas-relief of the Churning of the Sea of Milk shows Vishnu in the centre, his turtle avatar Kurma below, asuras and devas to left and right, and apsaras and Indra above. ^ SENDAI GREAT TUG-of WAR (Sendai Otsunahiki / 川内大綱引き) Kagoshima Internationalization Council. ^ Lynch, Molly. "Dragon boat tug of war is Poland's newest sports craze". Mashable. Retrieved 2017-08-15. ^ "Home". Tugfest. Retrieved 2018-08-30. ^ "Delta Chis Win Tug-O-War As Large Crowd Watches". The Miami Student. 074 (55). May 24, 1949. Retrieved March 20, 2018. ^ "Fraternity Tug-O-War Teams Begin Practice For Struggle". The Miami Student. 074 (56). May 20, 1949. Retrieved March 20, 2018. ^ "Greek Week Has Brief, Busy Past". The Miami Student. 088 (44). April 20, 1965. Retrieved March 20, 2018. ^ "Greeks Set Theme Of 'Athenian Antics'". The Miami Student. 088 (42). April 13, 1965. Retrieved March 20, 2018. ^ "Greek Week Scheduled". The Journal News. April 29, 1971. p. 62. Retrieved March 20, 2018. ^ Farrand, Allison (October 4, 2016). "Victory in Hope College annual 'Pull' goes to sophomore class". MLive Media Group. Retrieved August 1, 2018. ^ a b "TWIF Rules". 2017 TWIF Rules Manual. Tug of War International Federation. 2017. Retrieved 2018-04-08. ^ "Tug-of-War Ends in Muliple Injuries". Gadsden Times. 14 June 1978. Retrieved 15 March 2017. ^ Two Men Lose Arms in tug-of-war, The Nation, October 27, 1997 (available at Google.news). ^ Tug-of-war: accident leaves arms hanging and mayor apologetic (China Times Tue, Oct 28, 1997 edition (available at Chinainformed.com). ^ Disarmed - Disarmanent at Snopes.com. ^ "Teens recovering after losing fingers during tug-of-war match". Associated Press. February 5, 2013. Archived from the original on February 7, 2013. Henning Eichberg, "Pull and tug: Towards a philosophy of the playing 'You'", in: Bodily Democracy: Towards a Philosophy of Sport for All, London: Routledge 2010, pp. 180–199. Wikimedia Commons has media related to Tug of war. This page was last edited on 25 March 2019, at 17:54 (UTC).